Supporter ($200) 2 tickets, name printed in the program. Advocate ($500) 5 tickets, name in the program, name read and logo in the program. Champion ($1,000) 5 tickets, name in the program, place banner, solidarity greeting. Visionary ($1,000-$5,000) 10 tickets, name in the program, place banner, solidarity greeting. 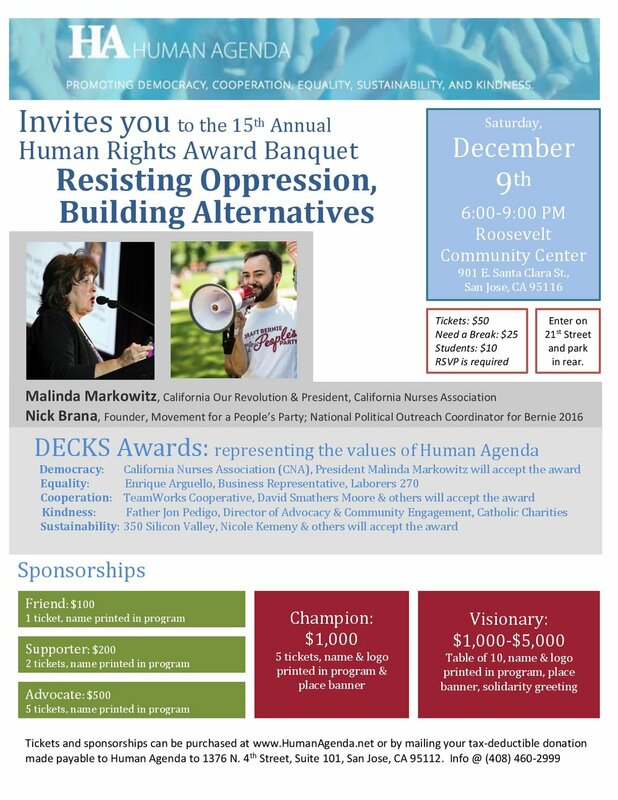 We will have two dynamic leaders speaking on the topic of “Resisting Oppression; Building Alternatives”: Malinda Markowitz, Co-President of California Nurses Association and National Nurses Organizing Committee and Vice President of National Nurses United & Nick Brana, Founder, Movement for a People’s Party; National Political Outreach Coordinator for Bernie 2016. Please sponsor the Banquet as a Visionary, Champion, Supporter, or Friend, or purchase tickets by December 2 online or via landmail. If you cannot attend, please make a donation to Human Agenda so we can sustain our work to improve our community, our democracy, and our economy. TRUMP SAYS NO. WE SAY GO.Feb.